It's looking more and more likely that tablets are the future of computing, and Intel acknowledged that fact today with the announcement of 2 new reference designs. Intel is following up the overpriced and under-specced Studybook tablet launched earlier this year with another 7" tablet and a new 10" tablet. Neither tablet has a firm release date or price, but one detail I can confirm is that the tablets are listed as running last year's version of Android on Intel CPUs. The 7" Intel Education Tablet has a screen resolution of 1024x600, the same as on last year's Nexus 7. It's running Android 4.1 on an 1.2GHz Intel Atom Z2420 CPU with 1GB of RAM, 8GB Flash storage, a microSD card slot, and a pair of cameras (VGA and 2MP). It also has speakers, microphone, Wifi, and several sensors. Is it just me or do those specs look similar to the specs for the Hisense Sero Pro, a $150 budget tablet that launched back in May? Aside from the different CPU, and Intel's custom software, it largely is the same tablet. Wow. So a Chinese gadget maker is out-innovating Intel. How embarrassing for Intel. Of course, Intel is also talking up the wonders of their education software. I would like to laud them for developing the software but unfortunately I don't see a way to get the software other than to plunk down my money for an Intel tablet. That is not what I would call a policy that is truly ed tech friendly, but I could be wrong. I find the specs for the 10" tablet to be as equally underwhelming. 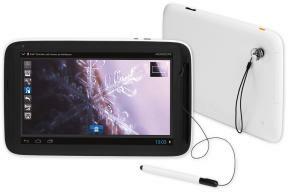 The larger tablet has a screen resolution of 1280x800, and it is running an even older Android 4.0 on a 1.6GHz Intel Atom Z2460 CPU. It has slightly less battery life (6.5 hours vs 8 hours for the 7" model) and twice as much storage but otherwise the same microSD card slot, pair of cameras (VGA and 2MP), sensors, speakers, microphone, and Wifi. I have not found any details on when these tablets will be available but if the Studybook is any indication then the new tablets won't be available until next year. Remember, the Studybook was announced 10 months before it shipped in February 2013. If the new tablets have that kind of a lead time then we'll see them by next April. I sincerely hope I am wrong, because by next April I expect to see good quality Tegra 3 tablets retailing for $99. And given that the Hisense Sero Pro is selling for $150 right now that prediction is not as crazy as it sounds. It’s hard to say for sure. The Atom architecture is not the same as the ARM-based chips running on other tablets, so one of these may run substantially different. I’ve never been able to run the x86 version of Android on my netbook, so I don’t know if it’s better or worse.